I always have a terrific experience on the rare occasion I need jewelry and would shop nowhere else actually.Jeanine made choosing a charm bracelet for our granddaughter a fun and special experience for her. No pressure ever. Highly recommend this jeweler and I live in North Carolina now. I had the germ of an idea for my daughter and her fiance's wedding gift. I had gone to two other jewelers. They were dismissive & didn't really try to help. I walked into Dearborn Jewelers, told them what I had in mind and they were all in with me. I had two wonderful women who understood the importance of this wedding gift. They stuck their heads together and took my idea and made it better. My daughter and her husband loved the matching pendant and cuff links that were customized for them, on their wedding day. I can't thank them enough for caring and "Getting It". I then wondered why I hadn't gone to Dearborn Jewelers in the first place. I have a watch that I bought on lay-away in 1967 for my Mom,lying in a jewelry box. I dug it out and am now wearing it. The only one I would trust with my wedding ring. My ring was damaged and after shopping around for 2 years for a good jeweler I could trust I was referred here. I just had a feeling I could trust them and was beyond happy with the results. They had to create a whole new band using my diamonds and it is more beautiful than my original. I also loved their referral to a great appraiser. Dearborn jewelers did an amazing job sizing my ring and I got it back quick too! My family & I have been going to Dearborn Jewelers since my parents purchased their wedding rings there in the late '70s. My husband & I purchased ours there in 2015. My siblings & I remember going to the Dearborn store as children. This is definitely a family owned business that treats you like family. We've never had a problem and receive the highest quality, friendly service each and every time. Two generations of our family recommend them! 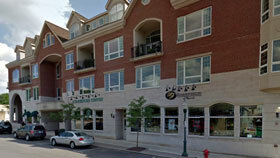 When I moved to the Plymouth area nearly 15 years ago I happened in to Dearborn Jewelers to "browse". Matthew invited me to do just that. I was not pressured to buy anything...just to enjoy (and try on) anything that caught my eye. Since then, I have done a lot of browsing, trying on, and sometimes, purchasing: amethyst, peridot, ruby and diamond rings, silver chains, gold necklaces, earrings, a wrist watch band, jewelry cases and even a piggy bank! Most recently, Teri assisted me over the course of 2 years to find five perfectly matched, deep red rubies for the ring I had envisioned. She worked closely with the manufacturer of the setting to create it in rose gold at my request. Joan, Joy and Emily have all worked "secretly" to help me surprise my daughter, too, with special gemstone jewelry she had enjoyed "visiting" frequently in the store.Every detail seems to matter as much to everyone at Dearborn Jewelers as it does to me. And you will not find more thoughtful, personalized customer service anywhere. Recently, Nick was on his way out the door to go to lunch when he overheard me mention to Teri that my watch battery needed replacing. He took off his coat and did it right away! He is such a busy and talented jeweler, and yet, he made such a small thing, my wrist watch battery, his priority.When you go into this store, take time to browse. You will see the best of the best in colored gemstones, diamonds, and one of a kind, unusual jewelry creations. Don't be hesitant to ask to try something on; they are happy to share their passion for fine jewelry with you. They also love to teach you more about your favorites, too. Attend one of their gemstone round table parties for a special night out. No pressure to buy, but a lot of fun to see rare colors and cuts and stones.And one more important detail - I shop with confidence at Dearborn Jewelers--their pricing is honest and not artificially inflated. Teri and Matt will work with you and your budget to help make that "special something" you admire your own! It's very simple.I purchased my wife's engagement and wedding rings from Dearborn Jewelers' Monroe store in 1971 and we are still doing business with them in Plymouth. Nothing else needs to be said about our feelings for this magnificent store and the people who own and work there. My wife passed away a year ago. She left her diamond engagement ring, plus some other jewelry with a lot of sentimental value. We have a 33 year old daughter, who doesn't wear a lot of jewelry, but she wanted to have something that reminded her of her mother. We took everything in to Dearborn Jeweler's, and they did a magnificent job. They took the diamond from the ring, and made a beautiful necklace. They did ear rings and another ring that was very well done. To make a long story short. They have preserved memories for both myself and my daughter, that will last a lifetime. I highly recommend Dearborn Jeweler's to anyone that wants a terrific job done with they're jewelry at a very reasonable price. For years I've wanted to update my wedding ring and have spent many, many hours trying on various settings but never found anything I liked better than my current ring. My 20 year old ring is solid gold and I have yet to find another setting with equal weight. I brought my wedding ring as well as another diamond ring I no longer wore to Dearborn Jewelers with an idea of updating it. I was assisted by Emily in redesigning my wedding ring utilizing the smaller stones from the other ring. All I can say is Nick is very talented. He plated my existing yellow gold band in white gold and added a diamond halo around my solitaire. I was blown away when I saw the finished creation. My new ring is gorgeous!!!! I've had my redesigned ring for a week and I can't stop admiring it. Your quality of work and customer service is excellent. I want to thank Joy for the assistance with my ring purchase. Joy recommended rings that were perfect, I chose one of the ones she recommended. Joy was very patient while I looked and reviewed with my finance, this took more than one visit. Then she had the diamond I already own set in a beautiful band/mounting. I was happy with the price and the final mounted ring. They also had me look at my diamond through the scope before it was set. I highly recommend Dearborn Jewelery and also recommend working with Joy. I am a picky buyer so this didn't come lightly as I visited four jewelers prior to this purchase in Novi and Northville. My fiance, and Dearborn Jewelers, could not have done a more amazing job on my ring. I hinted at what I wanted, but knew my fiance would have to have it custom designed. And with Dearborn, he made it happen! Swoon worthy. I pinned the unique design on Pinterest, and it's been pinned over 600 times and counting. I can't wait to go pick out our bands. We both highly recommend this jeweler! In search of getting a custom engagement ring we selected Dearborn jewelers based on their customer reviews, I hope that this review will help others to make a smart decision too. Upon emailing Dearborn jewelers to create a custom engagement ring they responded the SAME day, and we were able to set up an appointment with them for later in the week. Upon meeting I didn't know what to expect but Teri took great care in being extremely patient with me in stone selection. She went above and beyond to ensure that I knew what I was getting and to help me visualize it. She was also very cautious of our budget and ensured that we weren't looking at something that I would fall in love with that we couldn't afford. We had been ring shopping before and didn't enjoy the experience, but Dearborn jewelers gets it. They spend the time with you necessary to create a piece that you will love wearing, without pressuring you. I plan on returning to purchase wedding bands. They have created forever customers of my fiance and myself. Thank you again Teri and Matt! Thank you Joan and Matthew for working with me to get me the perfect ring!! I absolutely love my new ring. Your attention to detail and the ease of working with you will bring me back to Dearborn Jewelers, that's for sure. And the gift basket with my ring was icing on the cake. Thanks again. My family and I have been purchasing jewelry from Dearborn Jewelers for years now and have always had an amazing experience. My fiancé and I just picked out our perfect wedding bands with Joy guiding us every step of the way. She has been wonderful from the beginning. Not only Joy but everyone at Dearborn Jewelers go above and beyond to help you find that perfect piece of jewelry. We are customers for life. I definitely recommend going there, you will have an incredible experience. I could not be more impressed with the outstanding customer service, quality, and value I received from Dearborn Jewelers of Plymouth. Matthew was extremely helpful and provided excellent recommendations resulting in two beautiful pieces of jewelry. The cost was reasonable and the quality is top notch. Best of all, realizing that jewelry is so personal, Matthew was focused on helping me choose what I would be happiest with and the results are wonderful. And, he did all of this long distance because I live in a different state! I would highly recommend Dearborn Jewelers of Plymouth to anyone - local or long distance. 14 years ago we purchased mine and my husbands wedding bands from Dearborn Jewelers. 10 years ago Dearborn Jewelers custom designed and made my 2nd wedding band and I was in love with it. The design of the ring was very unique in that the inner band was platinum and squared off and the two outer bands were curved and 18K yellow gold. Over the years through age and constantly working with my hands, I could no longer get my wedding ring on and off my finger. I live in Iowa now and went to 5 different jewelers to have my ring sized and no one would touch it. They said they couldn't make it look like it does now. They told me they could only size it with either a piece of platinum or a piece of 18K yellow gold but they couldn't make it look like it does now. So I decided to call back to Dearborn Jewelers after all these years to see if they thought they could size it. And guess what, they said they could. We went back to Michigan for Christmas this year and I went in to the store. Joy and Teri said it wouldn't be a problem and that it would look exactly like it did the day I originally got it. They sized me up and said they would contact me when it was finished and that they could even send it to me in Iowa. Well 3 days ago I got my wedding ring back and I love it! Nick did an unbelievable job sizing it. You would never know that my ring was ever sized. It looks exactly like the day I originally got it 10 years ago. This experience with Dearborn Jewelers is not my only one. I have been dealing with them personally for the last 20 years and with my parents dealing with them before that. Teri, Matt, Joy and Nick are always there to help you out with anything. The thing I like best is they are true to their word. They don't give you the run around, they don't pressure you into anything. They truly listen to what you are looking for and help you find that. Their service is of a quality standard that can be hard to find these days. So don't hesitate to make Dearborn Jewelers your first and only stop when you are looking for that perfect piece! I can't put into words how pleased I am with the service and workmanship from Dearborn Jewelers on my mother's wedding band. This band is very special to me since my mother passed away 32 years ago. I placed her wedding band on my right hand and it's never been removed until last week. This ring means everything to me and I'm proud that my two daughters each had an interest in the wedding band. I asked Teri if she could help me by cutting the ring in half and then making new rings for my two daughters. Teri even suggested having the ring engraved on the inside with the words -- Always With You. My mother wore her wedding band for 32 years and then I was also blessed to wear it for 32 years. Now both of our daughters have a wonderful ring to wear in memory of their grandmother. Dearborn Jewelers treated the ring and me with a high level of respect. The end result is a wonderful testament to such a fine establishment and their dedication to quality work for their customers. I recommend Dearborn Jewelers to anyone for any reason -- you won't be disappointed!! I worked with the team at Dearborn Jewelers to create a 30 year anniversary ring for my wife. The custom work and service was terrific! I would trust Teri, Nick and the team with any project.